Indy Eleven march away with three points after a clean sheet victory over New York Red Bulls II, 3-0. The “Boys in Blue” end a seven-game stretch in 22 days with a win after a brace from forward Eugene Starikov and a goal from defender Reiner Ferreira in the first half. The team remains unbeaten in nine games, having last lost against Tampa Bay Rowdies on July 21. “Indiana's Team” obtained the lead just 101 seconds after the match started. Eleven midfielder Dylan Mares chipped a pass deep into New York's penalty box after winning possession near the edge of the field in the opposition's half. Starikov was on the receiving end of the pass when he managed a shot as he slid into the six-yard box. The Ukrainian's light touch was just enough to put the ball into the lower left corner of the net. The goal was Starikov's first of the night and Mares' first assist since returning to the Circle City last month. Red Bulls II attempted to respond in the fifth minute. Forward Andreas Ivan put his free kick attempt on target from the top Indy's 18-yard box, but Eleven keeper Owain Fon Williams leapt up and knocked the shot away from the frame. The 31-year-old keeper also managed a massive save in the 60th minute with Red Bulls II midfielder Andrew Tinari's shot off a crossbar deflection. Fon Williams' stellar performance, which included four saves throughout the 90 minutes, saw the Welshman tally his 10th clean sheet of 2018. Indy's lead doubled in the 21st minute. Midfielder Matt Watson played a cross forward into New York's box after gaining control of defender Carlyle Mitchell's interception. There was only enough time for the ball to bounce once before Starikov rushed in for another shot on goal, this time into the upper left corner of the goal. Starikov's two goals were his fourth and fifth on the season, respectively. With five goals, Starikov is Indy Eleven's second highest goal scorer of the season, trailing behind forward Jack McInerney's nine on the year. Indy scored its third and the final goal of the match in the 43rd minute. Midfielder Nico Matern broke away on a solo run into New York's half. His eventual shot was knocked out of the Red Bulls II box by keeper Evan Louro, only to be collected by Mares. Quick passing play to midfielder Seth Moses led to another short pass to Ferreira at the top of New York's box. Ferreira fought through three defenders for his shot that landed in the bottom right corner of the net. The goal was Ferreira's first and Moses' first assist since the pair signed with the “Boys in Blue” before the start of the season. 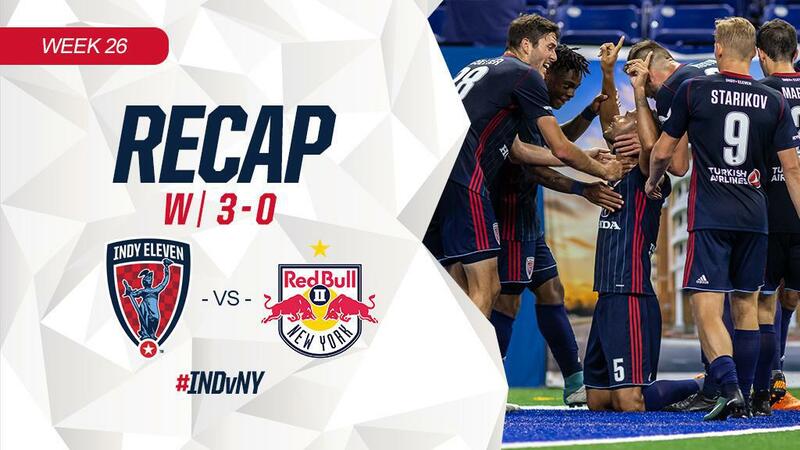 Indy's 3-0 victory concludes the longest run of back-to-back games in the club's history. The team resumes play in seven days on the road against Penn FC, giving the team much needed downtime before continuing its playoff push. The “Boys in Blue” return home on Wednesday, September 26, for Faith and Family Night against the Tampa Bay Rowdies. Fans can claim tickets to the midweek match at IndyEleven.com or by calling (317)685-1100. Wednesday, September 5, 2018 – 7:00 p.m.